RAK-Joy ... in Scandinavian oak. Ras Al Khaimah-headquartered RAK Ceramics has boosted its range of sanitary ware and tiles to meet today’s demand for eco-friendly products, hygiene, quality and design flexibility. Among its recent launches is RAK-Morning, a brand-new sanitary ware collection that incorporates its pioneering rimless technology. An affordable and wide range, with carefully finished details and quality design to suit international tastes, RAK-Morning has been designed to create ‘room for imagination’, says a spokesman for the company. “Creating eco-friendly and hygienic collections, which are also aesthetically pleasing, is key to the success of RAK Ceramics’ sanitary ware ranges and the company was also one of the first in the world to introduce rimless technology,” he says. RAK-Morning ... incorporates rimless technology. Combined with the latest water-saving technology, beautiful designs and silent flushing systems, the design of RAK Ceramics Rimless is based on the technology used in hospitals and medical centres. RAK Ceramics Rimless water closets allow customers to experience the same high standards of hygiene in their own homes. 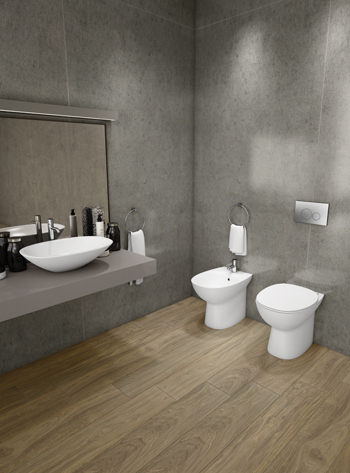 The company’s sanitary ware range includes a wide choice of products designed to suit all budgets and tastes. With a strong focus on water-saving technology, RAK Ceramics was the first manufacturer in the region to introduce a 2.5-litre half flush and four-litre full flush for its water closets back in 2009. Complementing its sanitary ware collection is RAK-Ecofix, a new flushing system by RAK Ceramics that incorporates the latest in water-saving technology and a dual flush 4.5/3-litre and 6/3-litre, saving from 30 to 50 per cent in water consumption with every flush. “RAK-Ecofix is the most efficient and integrated solution for drywall, solid-wall or low-height applications and includes a new collection of push plates, in two different designs and three finishes – white, chrome and matt chrome,” says the spokesman. In tiles, RAK Ceramics offers Maximus, the new generation of mega-slab applications. With the increasing popularity of super-sized slabs, Maximus makes it possible to create bathroom surfaces out of a single piece of porcelain, reducing the need for unsightly grout lines and creating a seamless look. Maximus is suitable for creating beautiful bathroom vanity tops, the spokesman says. Heat-resistant, recyclable, lightweight, durable and easy to clean, Maximus for countertops is available in the gigantic size of 135 by 305 cm and 14.5-mm thickness. The tile slab is also available for walls and floors in four different sizes: 30 by 240 cm, 120 by 120 cm, 120 by 240 cm in 10.5-mm thickness, and 120 by 260 cm in the new thickness of 6 mm. 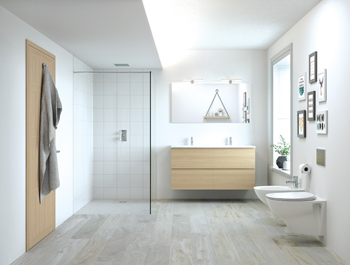 As a complete lifestyle solutions provider, RAK Ceramics offers a range of complementary accessories and bathroom furniture, which it has recently expanded with the launch of two additional collections to complete its contemporary bathroom suites – RAK-Feeling and RAK-Joy. RAK-Feeling is a range of stone-effect shower trays which are versatile and very easy to install. Created using Raksolid, a durable material composed of a mixture of natural minerals and resins, RAK-Feeling offers more than 130 different combinations of colours and sizes. The elegant matte finish with stone effect gives a distinctive appearance to the shower area, as well as being pleasant to the touch and featuring anti-slip safety. Ideal for both new buildings and renovations, RAK-Feeling combines quality with form and functionality to create the ideal shower area, says the spokesman. Meanwhile, RAK-Joy is a new collection of vanity furniture in four different finishes: Pure white, urban grey, grey elm and Scandinavian oak. The furniture comes with integrated thin drop-in washbasins. With clean lines accentuated by the J-pull handle profile, RAK-Joy offers the perfect bathroom storage solution.